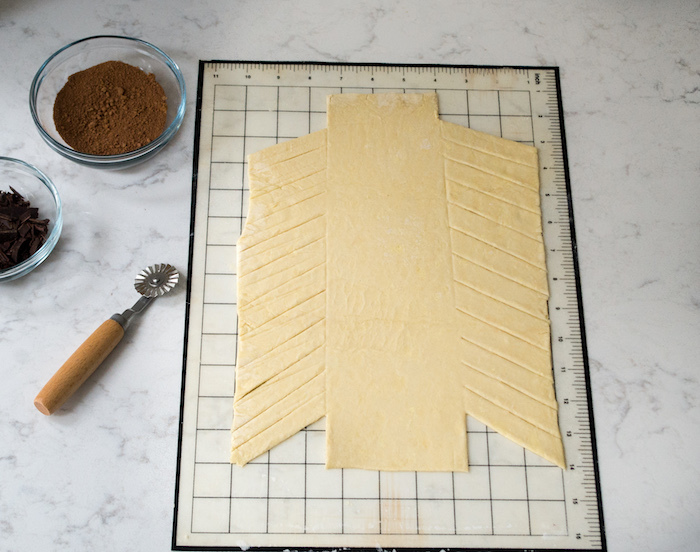 Puff pastry is one of my favorite freezer staples. I have never attempted to make it (yet), so I typically just have store-bought on hand. 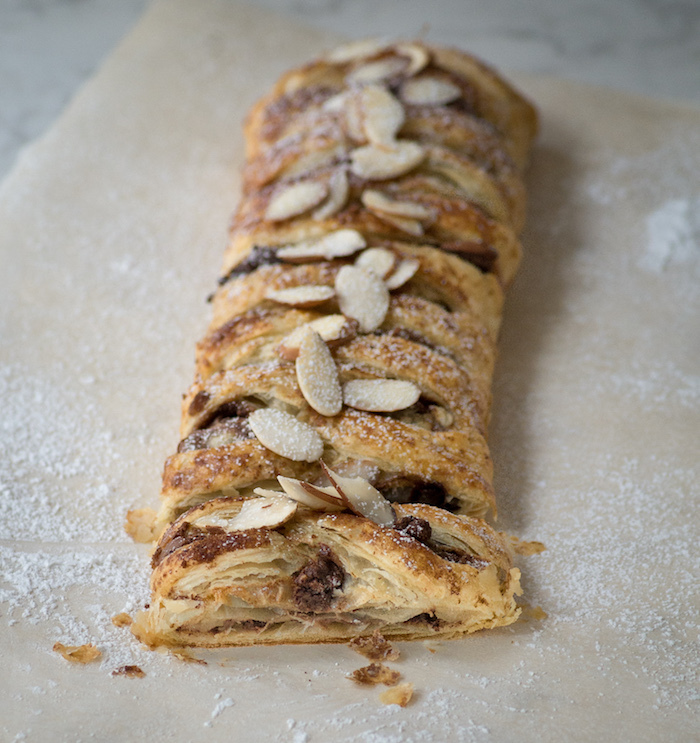 These pastry braids make a frequent appearance around our house as they are super easy, but look like they were complicated to make. Not to mention the filling can be anything you dream up. I have been craving chocolate lately, so decided to test out a triple chocolate variety. With the holidays fast approaching, I am also in house guest mode and these are great because you can quickly make a few different flavors to accomodate different preferences. Having a little one around this year makes the season even more special, but also motivates me to plan more, as living life more impulsively is no longer a reality. Not to mention the little guy's birthday is between Christmas and New Years. I am planning a bigger party this year since it is his first, but I am not sure how this will go as the years pass - any suggestions from those with holiday birthdays welcome! I should probably be embarrassed to admit this, but I am mildly obsessed with mermaid blankets. Grown-ups can own this right? I am not a big fan of fiction audiobooks, the dramatic readings..uh no thanks, but informational type books tend to be great on commutes and a big topic for me lately is the daily schedule. I am working to streamline mine as much as possible, so thought I would check out how the greats did it with Mason Currey's book - * Daily Rituals: How Artists Work. It works well because each chapter is short and covers one person, which is great for my short time frames in the car. 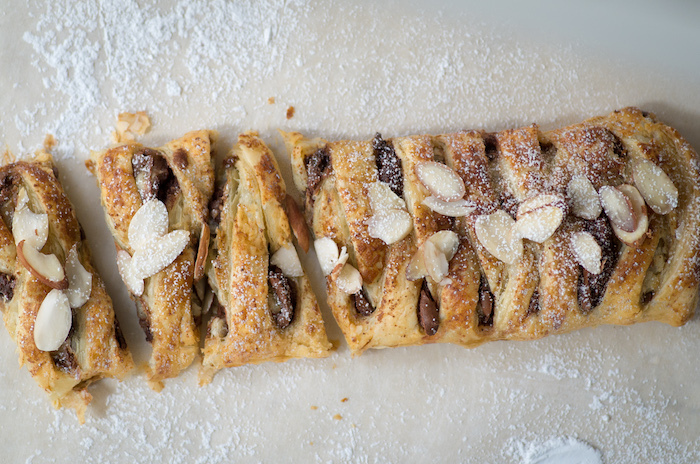 Recipe for a triple chocolate braided puff pastry. Heat milk on stove until tiny bubbles start to form around the edge of the pan (do not let boil). Place semi-sweet chocolate in a heat proof bowl, when milk is done heating, pour over chocolate and let stand for 5 minutes. Stir chocolate until it has completely melted. Add cream cheese to bowl and blend with mixer. Set chocolate, cream cheese ganache aside. Mix nutmeg, cinnamon, brown sugar and cocoa powder in a small bowl and set aside. 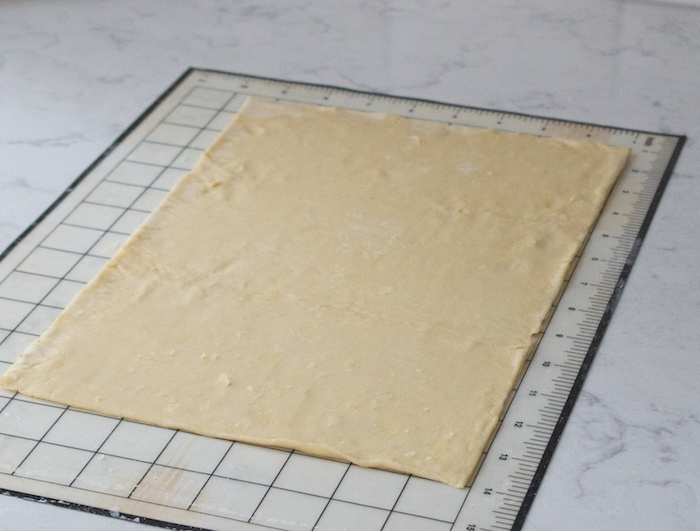 Roll out puff pastry to at least 10" x 14" on parchment paper or a slipmat. Cut a flap at the top and bottom, then cut an even number of strips on each side - I do about 12 (see above picture). Spoon chocolate ganache onto center of pastry, leaving flaps clean. Be sure to not overfill, depending on the size of your pastry you may not use all of the ganache. Sprinkle unsweetened chocolate chunks and cocoa powder mix over ganache. 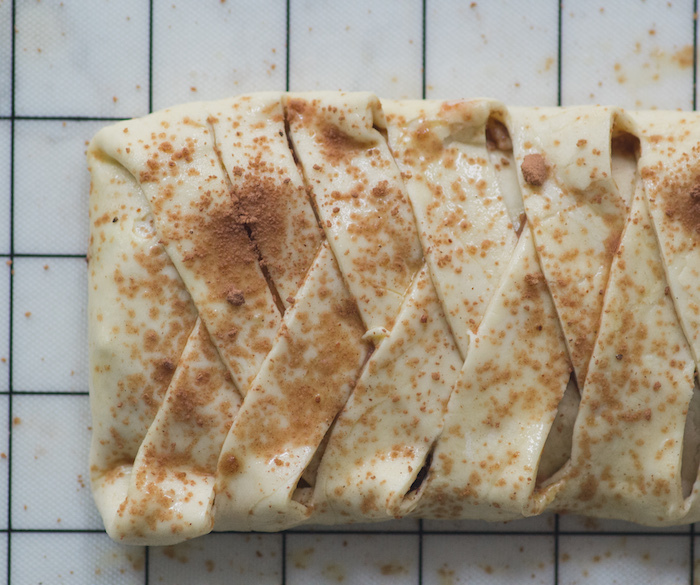 Mix egg and water and brush over pastry as you begin to fold flaps, then strips up. 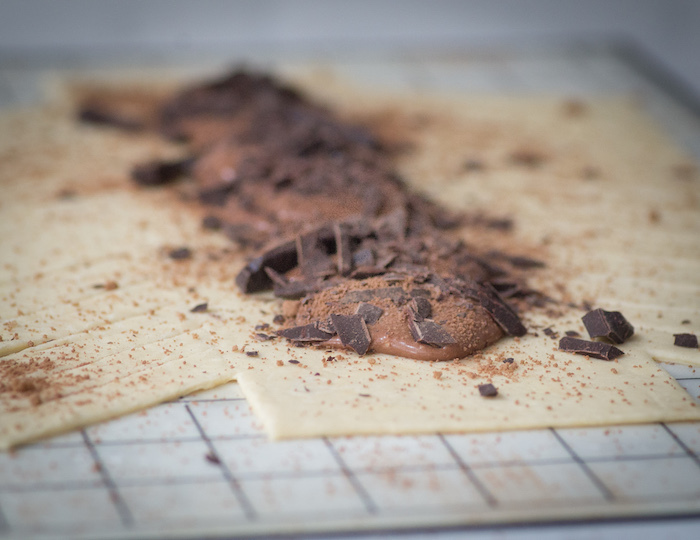 Be sure entire outside of pastry is covered in egg wash and you can sprinkle any remaining cocoa powder mix over the top. Bake in oven for about 25 minutes or until golden brown. If desired top with sliced almonds or other nuts.